For most people who started out in the early days of Pokemon – you know, those pesky “Gen Wunners” – there’s a special place that comes just before the first gym. It’s here that Ash caught his first Pokemon, that anyone can obtain a Pikachu with enough running around and spending time looking around and about, and that is iconic as any other place in Kanto. So iconic that even Kalos copied it. …no really, they’re very similar! Viridian Forest is a Stadium card that doesn’t say anything about catching a bunch of Caterpie, which already makes me sad for all the true Caterpie fan decks out there who still have no support for their favorite Pokemon to evolve and release into the wilds with a weirdly colored alternative of itself. Instead, the Forest lets either player, during their turn, discard a card from their hand to add a basic Energy card from their deck to their hand. While it didn’t make my own list (shocker, I know, there’s a bunch of cards like that), it’s not so surprising to see it on the list (again, shocker, there’s a bunch of cards like that). Having the ability to always effectively have Energy on-hand is actually very useful for a number of reasons: you get to thin out your deck, you lower the number of Energy in the deck overall to increase the value of your draws (you’ll usually want Trainers or Pokemon most of the time, though that doesn’t mean you shouldn’t run any Energy), and because of the cost to discard cards, you even have the option to trigger all sorts of discard pile-related cards and effects or Abilities! It really adds to the overall consistency of lots of decks, and it can fit into just about any deck that runs basic Energy! The biggest thing to worry about with Viridian Forest, then, is the competition for deck space. Sure, it helps to increase the consistency over time, but you can only use the effect once per turn, and on top of that your opponent also has the ability to do the same thing. Compared to other cards you could run, Viridian Forest might even seem like a bit of a drag. What good is guaranteeing you’ll have Energy in hand if your opponent can do the same thing? 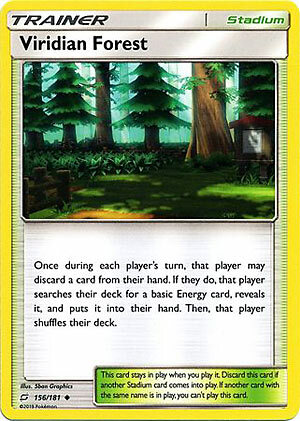 And let’s not forget that Special Energies aren’t valid to retrieve with Viridian Forest, which for some decks can be a problem in and of itself. So it’s pretty hard to judge whether or not Viridian Forest will have a large enough impact to be a mainstay in a lot of decks. It might be another case of needing some other partners to really work off of – similar to Zapdos from last Friday. And like Zapdos from last Friday, there are no doubt plenty of partners to work with! Anything that can play Energy from the hand or benefit off of the Energy you might throw into the discard pile springs to mind right away, so there’s definitely a spot for Viridian Forest in some decks. And who knows? It might just be what makes the cut in a few Standard decks as a result! …what? I’m being vague? Well, it’s been a while, so sue me. Arora Notealus: Viridian Forest is definitely one of the most iconic locations in all of Pokemon. It’s like the Cerulean Cave. Or Vermillion City. Or Lavender Town. Or Mt. Silver!…wait, no, that was Gen 2, does that even count as iconic to Kanto? I guess technically, it did show up. Although Cinnabar Island is probably more iconic. And really cool…okay, it’s a volcano, so it can’t be that cool. Haha, temperature jokes. Next Time: Special delivery from that one far-off unnamed island that Mewtwo was on! We begin the week with our 10th place pick, Viridian Forest (SM – Team Up 156/181), but this is not the beginning of our countdown: once again, we’re doing a Top 11! Viridian Forest is a Trainer-Stadium that a player may use once during his or her turn; discard a card from hand, and if you do, then you may search your deck for a basic Energy card. There are some generally good Stadium cards out there, which may preclude you from running Viridian Forest, and with cards like Delinquent, Faba, and Field Blower, even if your opponent doesn’t just drop their own Stadium card the next turn, Viridian Forest may not last long. Fortunately, as a Stadium with a fairly easy to use, activated effect, it isn’t too likely you won’t at least get to discard an opponent’s Stadium or avail yourself of the discard-and-search effect. If you manage to do both, you’ve gotten a decent return even if your opponent gets rid of Viridian Forest right away. Many decks run basic Energy cards, and we see a kind of odd win-win situation for Viridian Forest. If your deck runs few basic Energy cards, odds are added search power for the few you do would be helpful. If you run many basic Energy cards, your deck probably needs it and so – once again – that search seems helpful. Just getting slightly complicated, there are decks which need to run multiple basic Energy Types; Viridian Forest helps you ensure you’ve got the right one. There are decks that want something in the discard pile, and Viridian Forest provides a way to do just that, at least if the card you wish to discard is already in hand. At first, I wasn’t overly impressed by Viridian Forest, but then I read Vincent’s review. I don’t always read what the others write, but I’m glad I did today because I was thinking too narrowly when it comes to this card. I was thinking of decks like those built around Malamar (SM – Forbidden Light 51/131; SM – Black Star Promos SM117). Then Vincent pointed out Granbull (SM – Lost Thunder 138/214). I can’t believe I almost missed that it would be of use for Alolan Exeggutor (SM – Forbidden Light 2/131, 2a/131) decks! These decks all have cards they need to put into the discard pile as well as benefitting from additional basic Energy search, with Alolan Exeggutor decks needing to run a wide variety of basic Energy cards and some Malamar decks also being multi-Type. The problem for these and other uses popping into my head? Deck space. There are already multiple major Stadium cards that most decks consider, like Parallel City and Shrine of Punishment. Then there are deck specific options, like all of the new Prism Star Stadiums and old powerhouses such as Dimension Valley. There are even odd ones that aren’t really deck-specific but do reward certain decks better than others, such as Silent Lab or Sky Field. Remember those anti-Stadium Trainers I mentioned? In a weird way, they also tend to compete with Stadium cards for deck space. Even this weakness can be something of a strength; some decks really need to avoid hand clutter and/or prepare for multiple match ups, so running two, three, even four different Stadium cards can actually make sense for certain decks. Which is why I think Viridian Forest is a good card, potentially a very good card, but not a great one for the Standard Format, where the competition is less than in Expanded. For the Limited Format, it is a must-run; you want a potential “counter” Stadium any time there are at least two Stadium cards in a set, and while the effect will likely also benefit your opponent, that is because basic Energy search is much more valuable here! Viridian Forest does a simple thing, but it does it fairly well. At first glance, I was annoyed by needing to discard yet only receiving one basic Energy, but now I realize that is likely because the discard is itself a bonus for multiple decks. This isn’t a new staple for most decks, but it is decent in most and quite useful in a few. Viridian Forest makes its debut to the TCG as a Stadium card. It allows players to discard a card from your hand so that you get to search your deck for a basic Energy and put it onto your hand. This is a good way to get a energy card for whatever reason, whether it be using for manual attachments or paying for the cost from an attack, ability, or trainer cards. At the same time, your opponent also gets to benefit this before playing their own Stadium. The discard can hurt, but most of the cards can be recovered by one way or another. Viridian Forest (TUP 156) debuts in the Pokemon Trading Card Game out of the Team Up expansion set. If you discard a card from your hand, this Stadium allows you to select a Basic energy card from your deck and put it into your hand. Why not any energy card, Special and Basic? Since it is just a single Basic, why would you have to discard a card from hand to get it? Why not just replace this with a Basic energy card in most decks as very few decks run two different types of Basic energy? This card is very disappointing to me. Unless you’re playing an archetype that needs two different colors of energy, or if you can’t possibly find another Stadium better than this, I doubt that this card will see much use at all. Now, if it were “Attach a Basic energy from your deck to any of your Pokemon,” this card would be one of the best cards in the game and might just be the best card in the set. Almost every archetype would play at least a couple of them if not a four of. Unfortunately, as is normally the case, Pokemon deliberately underpowers another potentially metadefining card and automatically relegates this card to a barely useful status. I thought that Stadiums might become essential in this new format, particularly with Black Market Prism and Wondrous Labyrinth Prism, but in 36 games I’ve yet to see either of those cards yet, so until I start seeing more of those two Stadiums, I’m not packing more Stadiums into my decklists to counter them. Unfortunately for Viridian Forest, that means there’s even less chance of it seeing play.